The San Juan River twists and turns through the most convoluted canyon in the Colorado Plateau. Its home in southeastern Utah is a place of surreal beauty and vibrancy, hundreds of millions of years in the making. Eons of wind and water erosion have left an intricate wilderness of sunbaked red rock cliffs, canyons and monuments interwoven with cool, shady alcoves, lush grottoes, and side canyons where diverse vegetation grows near trickling streams. A bottomless archeological treasure chest, this area encases numerous remnants of ancient civilizations—most prominently, the Prehistoric Puebloan culture. For unknown reasons this intriguing Native American group abandoned the area around 1300 A.D., leaving behind their granaries, cliff dwellings, kivas, watchtowers, and panels of unique rock art. We’ll meet at 7:00 PM at the Recapture Lodge in Bluff, Utah for a pre-trip meeting. This is an opportunity to meet your fellow travelers and guides, and ask any last-minute questions. Your guides will give you a thorough trip orientation and pass out your waterproof river bags so you can pack your belongings that evening. We begin our day with a 4-mile drive from Bluff to our put-in at Sand Island, where your boats and your OARS crew await. After a thorough safety talk, our journey begins. We’ll peacefully float for a few hours, getting to know our fellow travelers and soaking in the majesty of our surroundings. Our first stop is Butler Wash, where we’ll be amazed by petroglyphs engraved across a sheer rock wall. The figures depicted here are considered by some to be “Kachinas,” or gods. This is an excellent introduction to rock art we’ll see as we head downstream. We’ll also see “moki steps” that were carved into the cliffs at least 800 years ago. Not much farther down river we stop for a short walk to River House, a well-preserved prehistoric cliff dwelling. We have time to explore this multi-room structure and admire the rock art including human hands, sheep and snake figures that adorn the overhanging walls and ceiling. We might also explore where the Hole in the Rock expedition first arrived in the area in the late 1800’s on the famous Mormon Trail. Our first day generally sets the pace for our river trip. Typically, we spend a few hours on the water in the morning, sometimes stopping for a great hike, a visit to a waterfall or a prehistoric ruin, or a refreshing swim. At lunchtime, we pull over to a sandy beach and enjoy a delicious picnic. After feasting and relaxing on the beach (or perhaps swimming, a game of Frisbee or a nature walk), we get back in our boats and watch the desert panoramas slowly develop and change as we peacefully float down the river. Mid- to late-afternoon, we stop and make camp; you grab your bags and set up your tent while we take care of the kitchen and “living room”—camp chairs and the site for tonight’s campfire (if permitted). This is the perfect time for you to lounge on the beach with that book you’ve wanted to finish. Before long, you’ll be savoring pleasing hors d’oeuvres and the beverage of your choice—delicious as these refreshments are, they always taste better after a day on the river! Read, nap, or just sit back and laugh with friends and family as your guides prepare dinner. After a satisfying feast, the evening is yours to spend however you wish. Maybe music, stories, or jokes will bring us together tonight; maybe the popping of the fire, the whisper of the river and the clarity of the big, star-filled sky will encourage silent reflection on the amazing wilderness that is, for now, our home. Your day begins as the cliff walls reflect the colors of sunrise. Fresh coffee and tea are waiting when you get up; grab a cup, sit back and take in the glory of the awakening river. Soon breakfast is served—omelets made to order, blueberry pancakes, sizzling bacon, fresh fruit, toast and juice are among the treats you will indulge in each morning. Once you’ve eaten your fill, you pack up your things as the guides break down camp, then our new day’s adventure begins. As the San Juan carries us further into this majestic geological corridor, we begin to see evidence of the earth’s activity—slow and steady, or sudden and violent—over the course of the river’s 300-plus-million-year existence. Within the first 10 miles, the river crosses the Comb Ridge monocline, a gigantic upwarp that extends unbroken for over 50 miles. A hike to the Mule Ear diatreme reveals an eruptive ground vent and a rubble mass of rocks from the earth’s mantle. Then it’s back to our boats to begin our descent into the upper San Juan canyon, where we meet our first whitewater, Four-Foot Rapid. Eight-Foot and Ledge Rapids also spice up our tranquil float as we enter the upper “Narrows,” a particularly tight gorge carved out of the brilliant rocky layers by the very river upon which we drift. On Day 4 or 6 we reach our take out at Mexican Hat. Having enjoyed the camaraderie of past days and the magnificence of the river corridor, we say our goodbyes upon returning to Bluff. Wetsuit–weather dependent (does not include wetsuit booties, or footwear of any kind). For clients with a high interest in using the inflatable kayaks, we will bring a limited supply of wetsuits. If you have your own, please feel free to bring it with you. Sleep Kit: Can be rented for $40 per person. Sleep kits include a sleeping bag, deluxe 3-inch thick foam and air-filled sleeping pad, ground tarp, sheet, pillow and pillowcase. Please indicate on your Guest Registration Form whether you want to rent a sleep kit or if you prefer to bring your own. ☐ Trip Forms (online): Each participant will need to complete the required trip forms within two weeks of making a booking. Refer to your confirmation e-mail for the link to the online forms. If you prefer to fill out paper forms, please let us know right away. If you are reserving within 60 days of departure, your forms must be completed immediately to ensure we can properly plan for your trip. The day before your trip we will meet at 7:00 PM in the lobby of the Recapture Lodge for a pre-trip meeting. Your trip leader will provide a thorough trip orientation and pass out your waterproof bags so you can pack your belongings that evening. The trip leader will also confirm the meeting time for the following morning and give you an opportunity to ask any last-minute questions. 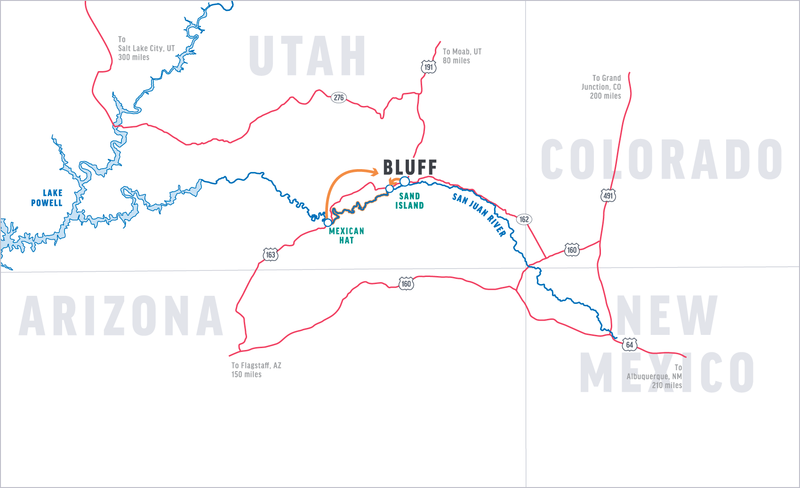 Bluff, Utah is located in southeastern Utah. From Moab, take Highway 191 south. You will go through Monticello and Blanding. When you get into Blanding you will come to a four-way stoplight. You will need to make a left turn and continue on Highway 191 south. You will eventually descend into Cow Canyon when you near Bluff. You will continue on Highway 191, which is also called Main Street in Bluff. The lodge will be on the left side of the road near the center of town. From Salt Lake City, take I-15 south to the Price/US 6 exit. Then take US 6 to I-70 east, to US 191 South. You will eventually descend into Cow Canyon when you near Bluff. You will continue on Highway 191, which is also called Main Street in Bluff. The lodge will be on the left side of the road near the center of town. If you’re coming from Grand Junction, Colorado take I-70 West to US 191 or take scenic route 128, which follows the Colorado River and offers spectacular views, to Moab and US 191 (adds a half hour). Follow 191 South to Bluff. Unless you have a large group, a rental car from Salt Lake City is usually the best option even if it sits for a week while you are on the river. Often it is still more economical than a van shuttle and gives you the flexibility and convenience to visit the surrounding National Parks before and after your rafting trip. If you’re arriving by car, parking is available at the Recapture Lodge. There are several options for chartered shuttle service. Check discovermoab.com/shuttle.htm for a list of current operators. On the final day of your river adventure, you will be returned to the Recapture Lodge. You should arrive between 2:00-3:00 PM. Pre- and Post-Trip AccommodationsWe recommend that you make reservations well in advance in order to guarantee lodging as Bluff has limited lodging options. We recommend the facilities listed below. (Pre- and post-trip lodging is not included in the trip cost). *Please mention you are an OARS guest when making your reservation. A major tributary of the Colorado River, the San Juan forges a watery path through some of the world’s most splendid wilderness. A calm, congenial river, the San Juan offers a relaxing float trip livened up by fun Class II rapids. Please note: During the high-water season use of inflatable kayaks and standup paddleboards will be at the guides’ discretion. Hiker: With its impressive collection of archaeological treasures and prolific displays of rock art, the 27 river miles from Sand Island to Mexican Hat provide multiple options for extended hiking away from the river. These 27 miles are covered over 4 days on our standard departures, but our 6-day Hiker program plans for layover days at the camps best situated to access the amazing all-day hiking opportunities. Cliff dwellings and gorgeous Ancestral Puebloan rock art are on prominent display in the San Juan River canyon. Many centuries later, gold miners, explorers and river-running pioneers added an Old West flavor to the San Juan’s history. Led by a knowledgeable OARS guide, we’ll explore the fascinating ruins of early civilizations that all but disappeared from the planet centuries ago. Archaeoastronomy (Stars with Lars): With its impressive collection of archaeological treasures and prolific displays of rock art, the 27 river miles from Sand Island to Mexican Hat provide multiple options for extended hiking away from the river. These 27 miles are covered over 4 days on our standard departures, but our 6-day Archaeoastronomy program plans for layover days at the camps best situated to access the amazing all-day opportunities to explore the archaeological wonders tucked into the side canyons. In addition, the upper and it’s lower cliff walls offer access to clear, dark skies undiminished by urban light pollution, you’ll witness a star display as you’ve never seen before. OARS astronomy trips are scheduled around the new moon to allow for optimal stargazing opportunities. Our resident astronomy expert, Lars Haarr, puts his laser pointer to good use and provides informal educational discussions each evening on such topics as the history of constellations and Native American interpretations of star movements and groupings. During the day, enjoy hikes to prehistoric cliff dwellings, petroglyphs, granaries, and more. We provide fresh water and an assortment of soft drinks, including sodas, sparkling water, fruit juices and lemonade. Commercial outfitters may not provide any type of alcohol for their guests. You may bring your own supply of beer, wine or liquor in non-glass containers. If you choose to bring your own drinks (other than what we provide) or alcoholic beverages, please let us know in advance, ideally at the pre-trip meeting. For your safety and the safety of others, alcoholic beverages are limited to camp. Some beers (3.2% alcohol by weight) are available in grocery stores. For other beer, wine and liquor you will need to go to the Utah State Liquor Store. For further information, including hours, locations, and selection please visit their website: abc.utah.gov/stores/. The San Juan has many great hiking trails. While we generally plan at least two guided hikes on each trip, there is ample opportunity for the curious to explore the area at length. Please let your trip leader know if you are an avid hiker and remember to bring extra water bottles and good shoes. Remember, however, that all hikes are optional and you can choose to lie on the beach and take in a few tanning rays or read a book instead. While the idea of a river trip is appealing to most people, many are inhibited or reluctant because of modesty or uncertainty. To minimize our impacts, we carry out all solid human waste and use a portable toilet system that is set up each day at camp in a secluded location a discrete distance from tent sites. It is essentially a toilet without plumbing and is available from the time you pull into camp each afternoon until you leave camp the next day. Toilet paper and a convenient hand-washing station are provided. Bathing is allowed in the San Juan River, but must be done with biodegradable soap. It is not, however, allowed in any of the side streams that feed into the river. If you plan to bring soap, we recommend Campsuds or Dr. Bronner’s, which can be purchased in most stores that have a camping section. Disposable anti-bacterial towelettes (Coleman Swash Cloths, baby wipes, etc.) are good alternatives to submersion in the river and are especially convenient for spring and fall trips. *The use of drones is prohibited by the Bureau of Land Management on the San Juan River. Once you are on the river there is limited communication with the “outside world.” Cell phone service is not available. Our guides carry satellite phones which are strictly used to call out in case of an emergency situation on the river. They can call out, but we cannot call them. Periodically the trip leader will check in with our office. If you have someone that needs to contact you about an emergency at home, they should call our office (800-346-6277). If possible, we will relay the message to you. Keep in mind, however, it could be several days or longer before the message actually reaches you. For your family at home you should define for them what you consider to be an emergency and provide them with instructions to call our office in the event one occurs during your vacation. You may want to check one week prior to your trip for an up-to-date weather forecast. We recommend the following website: www.wunderground.com for weather in Bluff, Utah. The flow of the San Juan River varies according to snowmelt and reservoir releases from the Navajo Dam. Because the whitewater is generally moderate, higher or lower flows do not considerably change the experience. Peak flows usually occur between mid-May and mid-June, but can vary widely from early May and into July. Water temperatures are coldest during the high water period and rain gear and warm synthetic clothing will be required. A good way to keep cool is with a sarong or long-sleeved cotton shirts. They can be soaked in the water and worn in the raft or carried on a hike for later use. This method of evaporative cooling is very effective. Bandanas are another useful item that can be used in this manner. During summer months, conditions on the river may be hot and sunny. These trips require less gear than spring or fall trips, but thoughtful packing is still required. Protection from the sun and heat will be critical to your enjoyment and health while on the river and during side hikes. To protect yourself from the sun’s rays, consider bringing long-sleeved shirts and pants. Lightweight, nylon ‘safari’ shirts are readily available and often come with a UPF rating for reflecting harmful ultraviolet rays. These pack small, light, are quick drying and often offer ventilation to help keep cool. March, April & May Trips: These are surely some of the most beautiful months to be on the San Juan River, but they can also produce some surprisingly chilly temperatures. During the spring, the sun is not far enough north in the sky for its warming rays to reach down into the river canyon for as many hours a day as it does in the summer. This means more shady areas, fewer sunny ones. Therefore, when you are splashed (drenched) going through the rapids and you’re in a shady area, you will get very cold unless you are prepared. At the pre-trip meeting each person will be given two large waterproof bags (approximate sealed size: 13” diameter x 25” tall; 3318 cu in; 54.4 L). One bag will be for your clothing and personal items; the other bag will be for your sleeping gear (sleeping bag, sleeping pad, ground tarp, sheet and pillow). These two bags will be your “checked luggage” and will only be accessible in camp. Tents are stowed separately. Please note: if you rent our sleep kit, it will come already packed in one of the 2 waterproof bags issued to each passenger. We also provide a small waterproof bag for day use where you can keep items such as raingear, camera, sunscreen, lip balm, etc. (approximate sealed size: 17” tall x 9” diameter; 1081 cu in; 17.7 L). The bags are cylindrical in shape and pack from the top. Please pack light, and keep in mind that river attire is casual: comfort, convenience and boat space take precedence over style. At the end of the trip, you will return to Bluff with your waterproof bags, where you will be able to unpack your gear before your trip home. If you have extra luggage it should be locked in your car or stored at your hotel. We recommend that you leave your valuables at home. For personal items like wallets, purses and cell phones, we recommend leaving them in your car if possible, or in a zip-lock bag at the bottom of your waterproof bag with your clothing. In reviewing your statement, you’ll note a $1/person/day donation to Utah Rivers Council, a non-profit conservation organization dedicated to Utah’s rivers and clean water sources. One-hundred percent of these funds go directly to Utah’s rivers and your contribution is tax-deductible. This donation is voluntary and may be removed from your invoice if you choose not to participate. Please notify our office if you would prefer to delete the donation from your balance. Everyone is required to sign a standard liability release form before the trip, acknowledging awareness that there are some inherent risks associated with the trip. However, due to the nature of the activities, a condition of your participation is that you will sign this form and return it to our office before the trip begins. Anyone who refuses to sign the form will not be allowed to participate, and consistent with OARS cancellation policy, there will be no refund of the trip fees at that time.